In addition to my own pictures, I added a few better ones from the creative folks at Flickr Creative Commons. Thanks! Sydney is the most livable city I've ever visited, with its beautiful bay, good weather, pub culture and outdoor recreational possibilities. And the beaches along the coast add the crowning touch. 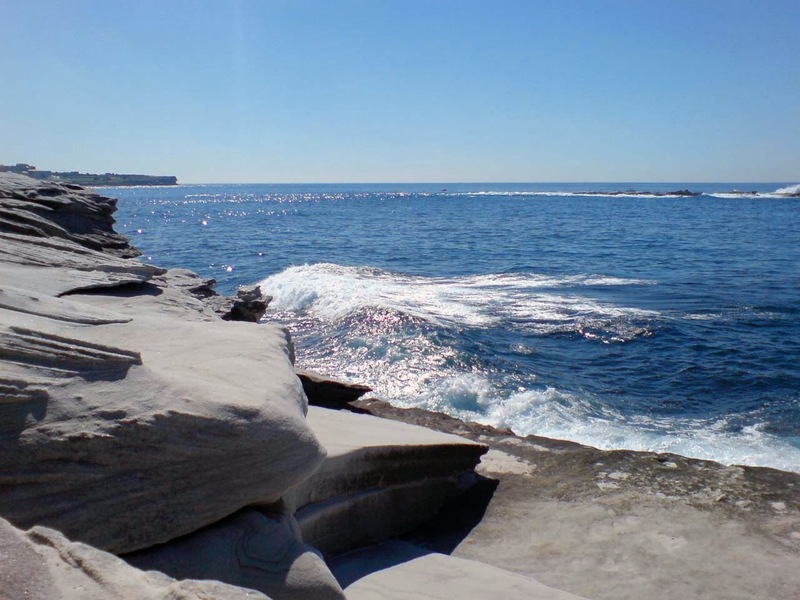 So make sure you get out to some of Sydney's beautiful beaches, sand crescents backed by cliffs, with swimming pools set into the cliff bases, and with rocks out in the distance and surfers out among them, braving the huge breakers. The cliff rocks are often carved by the winds into fascinating matrices of mini-caves and ledges. 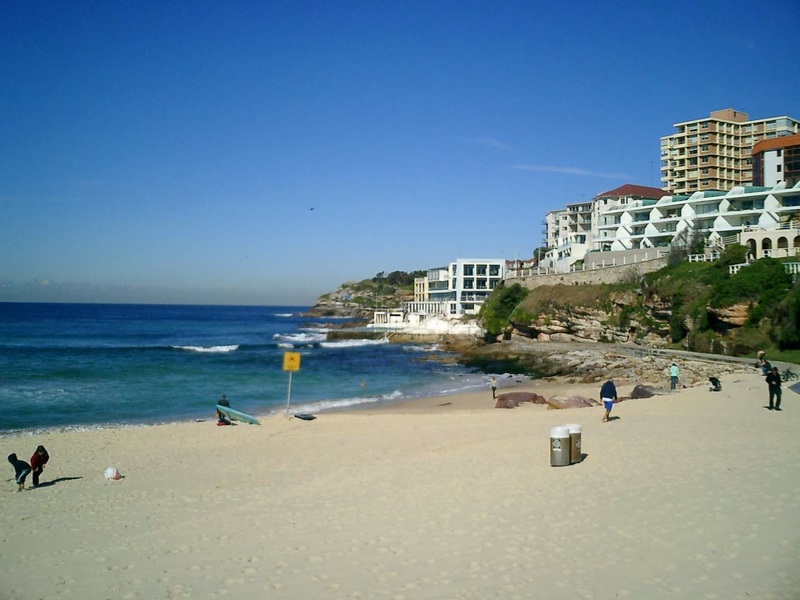 This spectacular route follows the Bondi to Coogee Coastal Walk, between these two beach neighborhoods in eastern Sydney. The trail follows the sandstone clifftops, with all the great scenery in between. It visits five beaches, plus countless vistas, rocks, parks, rock-pool baths, and beach houses: it's one of the most inspiring spots for a run that you'll ever find, anywhere. And it's right in this multi-million-resident city. On one of my last trips to Sydney, I decided to get a room in Bondi to enjoy some beach life in depth, and I was glad I did. You can get there from the city center by taking the T4 train to Bondi Junction, then a bus to the beach (lines 380, 381, 382 or 333). The trains and buses all run every 10 minutes. The 380 and 333 buses to Bondi Beach also leave directly from Circular Quay, in the city center. 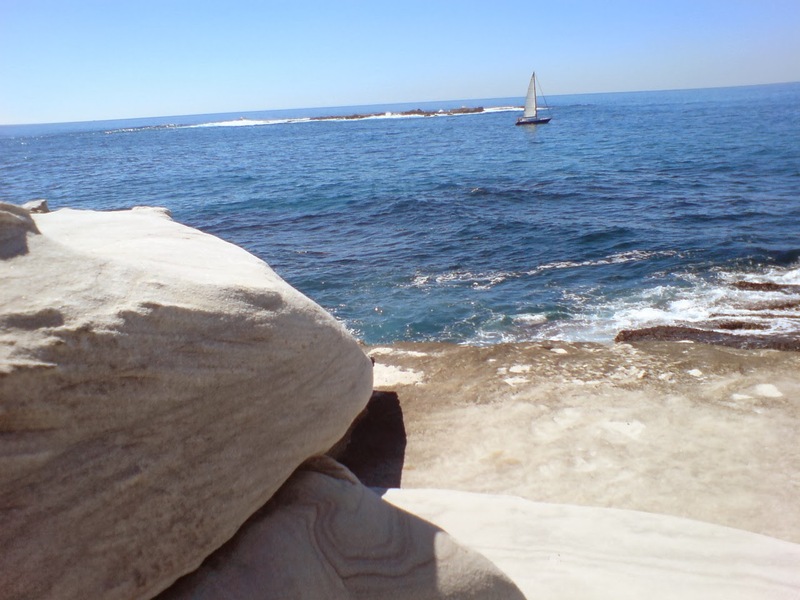 NOTE: At the end of every October, there is the Sculpture by the Sea exhibit along a 2-km section of the coastal walk, south of Bondi. Very cool stuff, but there are big crowds along the trail then, so make sure you run early before the crowds arrive. 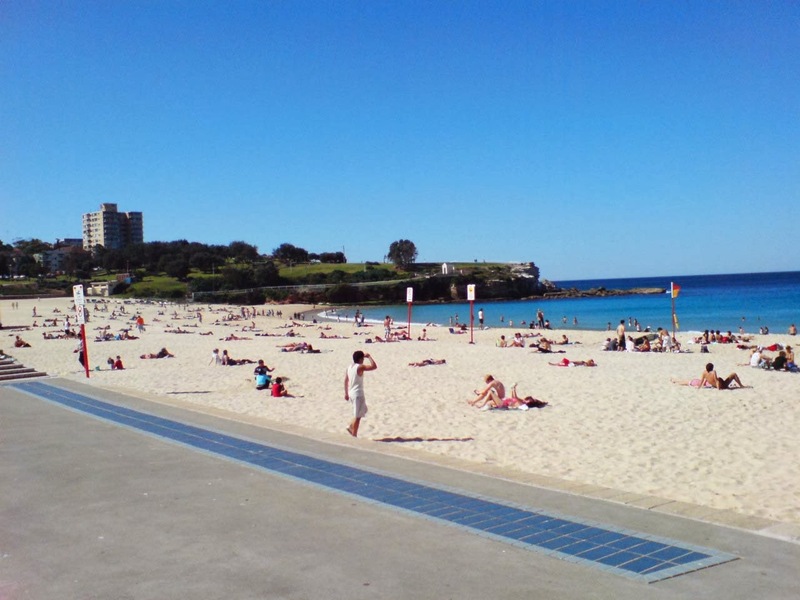 We'll start the run at Bondi Beach, at the pavilion right at the center of the beach. Turn to your right and, past the big semicircle of sand, you'll see the ocean pool of Bondi Baths. The coastal walk begins on the street right above the baths. So start running along the beach (either on the sand or on the promenade) towards the steps rising up to the right of the baths. The steps take you up to Notts Avenue, where you turn left and run past the Bondi Icebergs Club, which runs the baths. The Icebergs only allow members who have proven that they have gone swimming on most winter days for a few years in a row. And they have over 600 members! The street soon ends in a cul-de-sac, and you take the trail leading off to the left at the Coastal Walk sign, heading down along the rocks, with the waves crashing below you. You can see surfers ahead, off the cliffs of Mackenzie’s Point: it looks a bit dangerous out alone among those big rocks. The trail winds around the rocky point at Marks Park, then heads west towards quiet Tamarama Beach and the park rising up the hillside behind it. 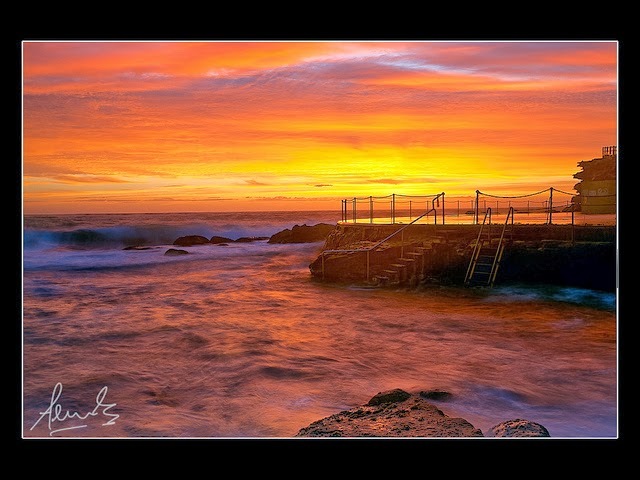 At Tamarama, you can either follow the trail down across the beach and then back up the stairs again on the other side, or exit the trail at the Tamarama SLSC lifeguards' house by taking the steps going up to Gaerloch Avenue and then follow Pacific Avenue as it loops around the beach and park. The trail now becomes a sidewalk along Marine Drive until you you round the next rocky point and come to Bronte Beach. At Bronte, at almost the 2.5-km mark, you can either cross the lawn of Bronte Park or run down along the paved promenade just above the beach itself. At the other (south) side, before the rock pool baths, you can take the stairs up to the street just above. This narrow one-way street used to be the old tramway, heading uphill. At the top of the rise, where the street turns to the right to head inland, leave the street to enter the Calga Reserve park, above the cliffs. At the far (south) end of Calga Reserve, look for the new boardwalk that takes you along the water side of Waverley Cemetery (you used to have to run inland, behind the cemetery). This is about the half-way point of the way to Coogee, at three kilometers. After the cemetery, the trail continues downhill along Ocean Street, with Burrows Park to the left, along the water side. You'll pass some lawn-bowling fields. After the last lawn-bowling field, at Warner Avenue, you could cut eastwards through the park to run along the cliffs again, instead of running along the street. When you reach the south end of Burrows Park, you'll see the narrow, fjord-like bay of Clovelly ahead. The trail now leaves the road to head down to Clovelly Beach. You can either try to cross the loose sand of the beach or follow the trail as it winds back behind the beach and back around the other side, as you pass the 4-km mark. The trail now follows the south shore of Clovelly Bay, heading up above the small rock-pool bath, and then up around the beach parking lot. You can already see Coogee Beach stretching out back behind the next rocky point. Maybe you thought you had seen as much gorgeous scenery as anybody possibly could during one run, but now, at the end of the parking lot, you come to the next beautiful bay, Gordon's Bay. The whole bay is lined by cliffs and rocks, and is a protected reserve. The trail follows the cliffs around the bay, going over a spot where local fishermen leave their little boats parked up under the cliffs, at the 5-km mark. Heading back uphill again at the south end of the bay, the trail enters Major Street, where, after a few houses, you can take the trail as it goes into the park on the left, Dunningham Reserve. You'll loop through the park and then head down to the last bit of the run: into Coogee Beach. When you reach the semicircular steps at the middle of the beach, this is the end of the route. One of my favorite Sydney hangouts is right across the street: the Coogee Bay Hotel and its courtyard pub. Now either turn around and run the 6.1 kilometers back to Bondi or take the bus. The 362 line heads back to Bondi Road, just a few blocks south of the staring point, or lines 372, 373 or 374 will take you back to the city. But I would plan to spend some more time out at the beach, wherever you stop, and go for a swim (there are showers) and try out one of the cafés. At Coogee, for example, you can sit outside overlooking the beach at the Barzura café, and enjoy their creative menu. Hey, this is the life, enjoy it! 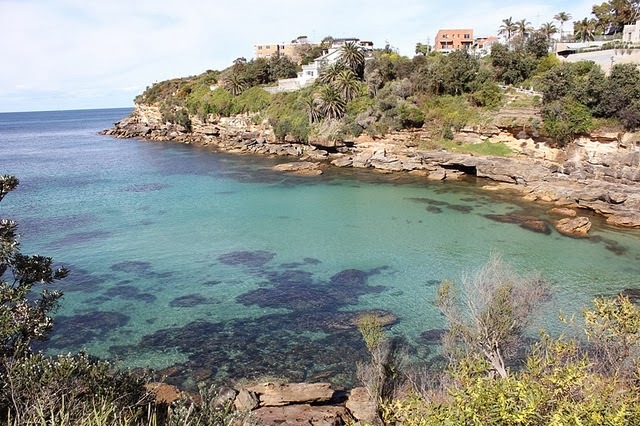 NOTE: You could even continue running southwards from Coogee towards Maroubra or further, if you haven't had enough of this beautiful coast yet, adding a few more kilometers to this beautiful route.